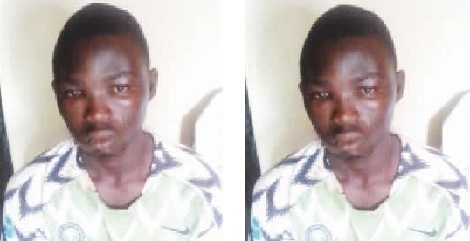 A self-confessed burglar, Daniel Olanrewaju, has ended up in police custody three weeks after he broke into a boutique in Agbado, Ogun State. It was learnt that the 22-year-old suspect was accosted by some vigilantes in the community while he was roaming about last Tuesday night. When he was questioned on his mission in the area, he reportedly could not give satisfactory answers. He was arrested and handed over to the police at the Agbado division. After further interrogation, Punch correspondent gathered that he confessed to have burgled the boutique and stolen trousers, jerseys, among other clothes. The resident of Somolu, Lagos State, reportedly led the police to arrest one Ibrahim, with whom he kept some of the stolen clothes. Olanrewaju told City Round during the week that he burgled the boutique on January 28, 2019 at night. He said he entered the attic and broke the ceiling to gain access into the shop. The furniture maker explained that after the operation, he took his loot to Costain area of Lagos and kept them with a friend. He said, “I was very broke because I could not get any work from my customers. While I was thinking about the way out, it occurred to me that I could steal. I decided to go to somewhere far from where I live. Olanrewaju explained that he was strategising on how to market the clothes without running into trouble until it was dark. He said he was stranded and decided to pass the night outside a shop. He said, “As I wanted to sleep, a vigilante shone the torchlight on me. I ran to hide somewhere. The man alerted other vigilantes and I was caught. They asked me what I was doing outside at night and I told them I was stranded. They were not satisfied with my response and they threatened to kill me if I did not say the truth. That was why I decided to tell them about the crime. He said, “I am a secondary school leaver and I learnt how to make furniture. I had once lived in Agbado with my parents before I relocated to Somolu. I was born in Lagos but my father was from Benin Republic. He died in 2016 from sickness. I relocated to Benin Republic with my mum.